ASAP aligns the client’s needs with the most qualified candidate, creating a strong synergy that results in a successful and long term work-relationship. Through personalized attention and customized service, ASAP aligns the client’s needs with the most qualified candidate, creating a strong synergy that results in a successful and long term work-relationship. Our business model is focused on quality, not quantity. Effective for high-volume, high-impact or specialized position requirements. Provides the flexibility to scale up or down when required. Excellent partner for outsourcing your recruitment process, from sourcing to on boarding and deployment/outplacement. Quick response to your specialized needs. Reduce your recruitment and screening costs. More time to focus on your HR strategy. Customized service for contract and direct hire personnel. Effective recruitment methods with in-depth local knowledge. Attending to clients needs, ASAP offers the most advanced and user friendly technology to manage timesheets. Manager and supervisors can Review and Approve assigned employees’ timesheets with ASAP Timesheets‘s simple 2-click process from anywhere in the world, using any computer or mobile device with internet connection. Assigned Employees can up-load and track their worked hours. 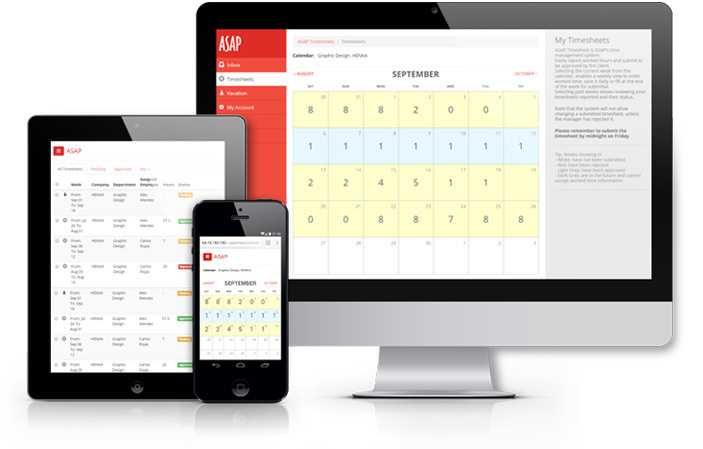 Adapting to clients’ busy and complex agendas and understanding that learning a New System to control team’s worked hours is not an option; ASAP brings ASAP Timesheet an intuitive, friendly two-click process saving time and headaches through the most innovative Time Management Tool available. Assisting clients needs of Data and Budget Control Tools, ASAP Timesheets allow managers and authorized users to obtain CSV, TXT or PDF reports to easily input in any CRM, ERP. Understanding the fast moving dynamics and need of a simple system for assigned employees to manage time and worked hours, ASAP brings ASAP Timesheets a friendly easy to use system to quickly report timesheets and keep focus and energy towards the assignment. Making life easy ASAP Timesheets enables every assigned employee to verify timesheet’s approval status, prior reported time, retrieve paystubs anytime and w-2s anytime from anywhere through a smartphone, tablet or computer connected to the internet.